Made by Suchanek, Lenka in Vancouver, British Columbia, Canada, North and Central America, 2010. 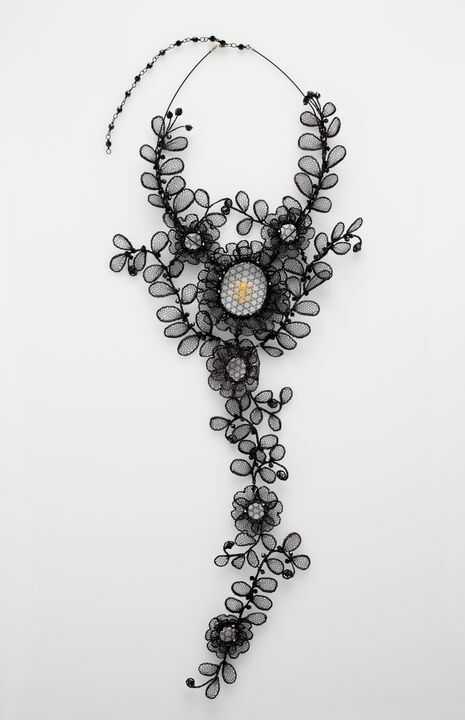 A necklace formed with daisy-like flower components and stylised round foliage made from black-enamelled copper wire frames filled with black nets of bobbin lace. The necklace consists of a foliate choker with two flower heads positioned just above a suspended larger central flower applied with a gold-wire Napoleonic bee in the middle. Attached to the central flower motif are three smaller flowers, positioned one above another and interspaced with foliage, which cascade in one single, gently curving line, towards the bottom. Small black Swarowski crystals are attached in places to simulate berries or flower buds. Made by Lenka Suchanek from Vancouver, British Columbia, Canada in 2010. The necklace is constructed through the use of the bobbin lace technique. For any lacework, the most important step is to use the right size of thread (or wire in metal lacework) and correct density of threads in the pattern. Suchanek usually makes four or five samples on a small area of the pricking to find the right combination. Once the pattern is established, many bobbins are prepared, wound in pairs. The winder is the only mechanical tool that is used in the process of bobbin lace. The pairs are taken into the work as necessary. There is no need to count the pairs, they are just added or taken out according to the pattern. The large number of pairs, especially in the widest area of the design, might seem quite intimidating to the viewer but it is not the real challenge of the work. A lace-maker usually concentrates on two pairs at a time, performing two basic steps of cross or twist, so the real skill lies in a sustained concentration on one step at the time. After thousands of these simple steps - if done correctly - the lace appears. This necklace, along with six wall hanging panels titled 'Are We Made of Lace?' (panels on loan only to Museum), were made for and displayed in 'Love Lace: The Powerhouse Museum's Third International Lace Award, 2011-2013'.